Tonight I realized that I must take hundreds of photos when we are working on a room reveal or a large DIY project. The sad part? Many of these never pictures make it to the blog. Editing photos is a very large part of blogging, and choosing the “money shot” is often our goal–which is why we snap so many photos. However, I realize that the non-pretty, raw photos of our messy house could probably answer a heck of a lot more reader questions versus a lengthy blog post from me, with perfectly coiffed photos. (Although I think Mark looks pretty cute on a ladder). 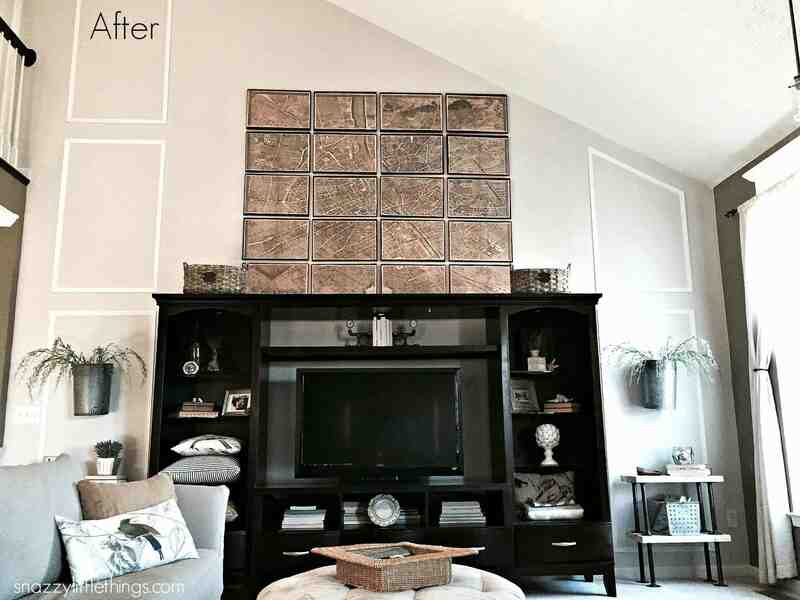 So here it is — our full family room makeover, from beginning to end. I’m starting to post more of these types of videos on my YouTube channel as well, so be sure to join me over there. These pictures are largely unedited. You’ll see dirty socks, tufts of dog hair on the floor from our shedding Sheltie…kids sleeping on the couch. This is us, our family in the raw. I hope that by sharing the room progression from start-to-finish it will help you understand just how much work goes into rooms like this, but it will answer several questions about how we hung our Paris Map art (a question that has come up a few times). And can I just say? Mark is pretty brilliant when it comes to measuring out a space like this. He’s a whiz with all the math and geometry that goes into trimming out the angled walls, but hanging the art was especially tricky. If you prefer to see the more edited version of this room reveal, be sure to visit this link for more details.